Why Should You Buy a Shower Water Filter? What Contaminants Do Shower Water Filters Reduce/Remove? Chlorine is the major concern for people who are in the market for a shower water filter. However, shower filters utilize various filter media to reduce other harmful contaminants such as: chloramines (which many water treatment plants are now using as a disinfectant alternative to chlorine), VOCs, scale, rust, sediment, iron oxide and hydrogen sulfide. Carbon filters remove chlorine, chloramines, VOCs and other synthetic chemicals often used in water disinfection, by the process of carbon adsorption, in which the chemicals stick to activated carbon. These are the most comprehensive shower filters, but since the adsorption process requires a lot of surface area, they are typically larger than other filters. Moreover, carbon filters are typically made for use with cold water (i.e. drinking water) and will not be as effective in a hot shower. KDF is an oxidation-reduction media made from copper and zinc. KDF shower filters work electrochemically, converting chlorine into soluble calcium chloride, which is harmless. However, KDF alone will not remove chlorine or VOCs and is often combined with Chlorgon filter technology. Chlorgon was specially developed and patented by Sprite Industries, and is only found in Sprite shower filters. It is made to work more efficiently with hot water temperatures, and is therefore an ideal media for shower water filters. Crystalline Quartz is added to some shower water filters to maximize lathering for a more "energy-enhanced feel." Sprite is a popular leader in the shower filter industry, having been in business for over 30 years. This company features the largest variety of shower water filters to compliment your individual needs and style. All Sprite shower filters feature a combination of KDF and Chlorgon filter media for the effective reduction of chlorine. Sprite filter replacement cartridges are reversible and may be turned after six months for an extended, year-long filter life. These come in two styles, contemporary and traditional. Eight spray massage settings make for a refreshing and relaxing shower. These shower heads may use the Sprite ARC filter replacement cartridge or the Sprite SLC Slimline shower filter cartridge for longer filter life. This filter comes in three color options: white, chrome, and white & chrome. Though it accommodates any standard shower head, it may be ordered with a specially-designed massage head. The Sprite Baby Shower uses a special adapter to attach to the kitchen sink faucet, making it the ideal way to bathe your infant in clean filtered water that will leave him or her with smooth, soft skin. Later, it can also be moved to any existing shower arm with the enclosed bracket. Sprite manufactures a variety of high output filters, including the Sprite HO-WH-M with water-saving massage head, and the Sprite HOB shower filters in several different color finishes: brushed nickel, polished brass, chrome and oil rubbed bronze. This shower handle with built-in filter features five adjustable spray settings. The Sprite Shower Falls Filter is one of the highest quality shower filters on the market, featuring a beautiful chrome finish. It's easy to install and perfect for taller men or women. The Sprite bath ball faucet filters come in three colors - white, chrome and trasnparent blue. These utilize a universal harness that attaches to your bath faucet, in order to reduce the amount of chlorine in your bath water. This filter installs onto your existing shower head, extending it no more than 1.5 inches. The cartridge should be changed every six months for optimum performance. This shower filter is one of the most durable in the AquaPure category, with a longer filter life of one year. This filter attachment is meant for use with your existing handheld shower head. The housing is available in two colors - polished chrome and polished gold tone. The filter should be replaced every three months for optimum performance. The AquaPure handheld shower filter system is white with chrome trim and features a 5-way adjustable spray, a triple-plated metal trim finish and a reinforced nylon hose. The filter cartridge should be changed every three months for optimum performance. This combination showerhead/filter offers five adjustable spray settings, with a high flow and large capacity filter cartridge. The filter should be replaced every six months for optiumum performance. For best results, use with the Rainshow'r Bernoulli Power Shower Head. This filter should be changed every 12 to 15 months. This filter may be purchased with Massage Head. 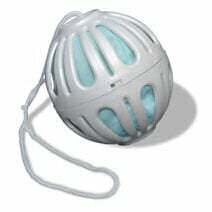 This bath dechlorinator circulates in your bath water to reduce chlorine. These Culligan shower water filters install on any standard shower arm. This shower head filter provides better diffusion of water to allow for a more gentle, thorough cleansing. 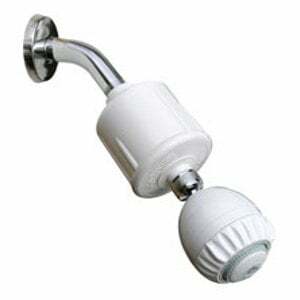 For greater adjustment for height and different water angles, you may want to add this compatible accessory to your purchase: the Culligan RainDisc Hi-Lo Adjustable Showerhead Arm. These shower filters feature a chrome finish, 5 spray settings, and rubber spray nozzles equipped with anti-clog mechanisms. This shower filter comes in two color finishes - white plastic and polished chrome. Showerhead is not included.